Villa for sale on a flat plot on two levels nestled at the base of the Montgo mountain. The property is approached by a long driveway and entered through a porch to the entrance hall. Greeting you is the L-shaped living and dining room with wood burner and beautiful exposed beamed ceilings with doors to the covered terrace (Naya). The modern and colourful kitchen with access to a utility room and the Naya. A bedroom with ensuite and 2 further bedrooms share a family bathroom. The staircase from the hall leads to the upper-level and master bedroom with ensuite and adjacent office or possibly another bedroom. There is gas central heating plus aluminium double glazing throughout. 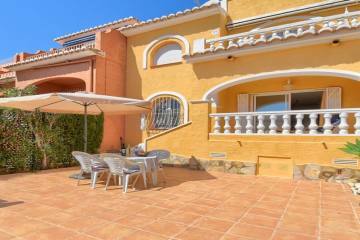 The plot is 1617 m2 and the pool area offers plenty of terracing along with a mature garden. The build size is 215 m2.